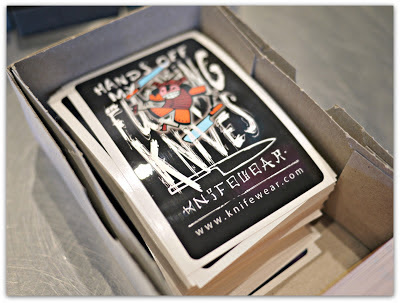 Maybe it's bad Feng Shui to write a post about sharp knives after not posting for yonks but I'll take my chances since it's all for a good cause. 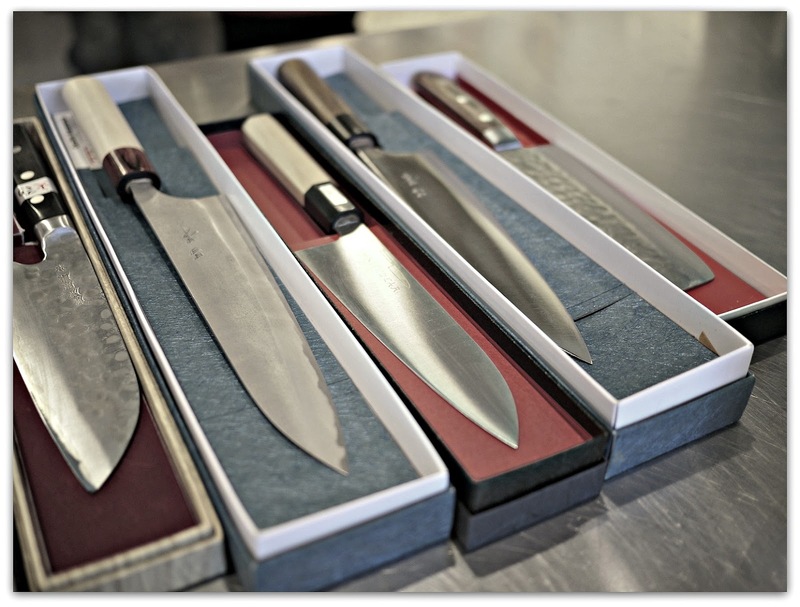 In this case, to let everyone know that KnifeWear, a Calgary company who specializes in hand-made Japanese knives is setting up shop in the Glebe in Ottawa and they'll be offering a proper "by hand" knife sharpening service using whetstones. Rejoice! Last Thursday, Jennifer Heagle of the food oasis, The Red Apron tweeted that she was hosting a knife sharpening demonstration given by Heather of Knifewear. I promptly cleared my schedule. If you cook, you know what a pleasure it is to use a sharp knife and how a dull one can turn your time in the kitchen into drudgery. I own two Japanese folded steel knives but I've always cheated when it comes to sharpening them. 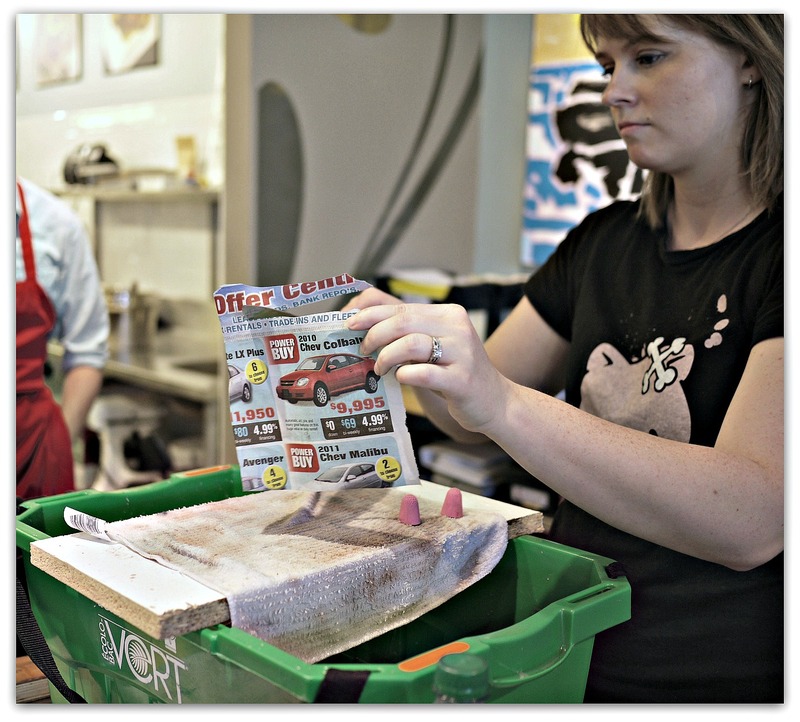 Like a negligent parent, I use a ceramic sharpening cone or sometimes, (oh the shame!) a steel, so I jumped at the chance to learn about sharpening my knives the proper way. I don't know about you but I've had my share of knife sharpening nightmares. First there was the heavy-handed guy in Canada who drives around the neighbourhood with his "grindstone in a truck" sharpening service ringing a bell while people come running with their dull blades. He cold-heartedly took the life of my favourite bread knife. More recently there was the knife sharpening reprobate in France who ruined my favourite Wusthof chef's knife. I had the naïve confidence of a newcomer that being French, they'd know how to sharpen a chef's knife. Wrong! I almost wept when my beautiful knife came back a week later, the once gentle curve of the edge was ground flat, making it a useless piece of junk. Live and learn and never again! 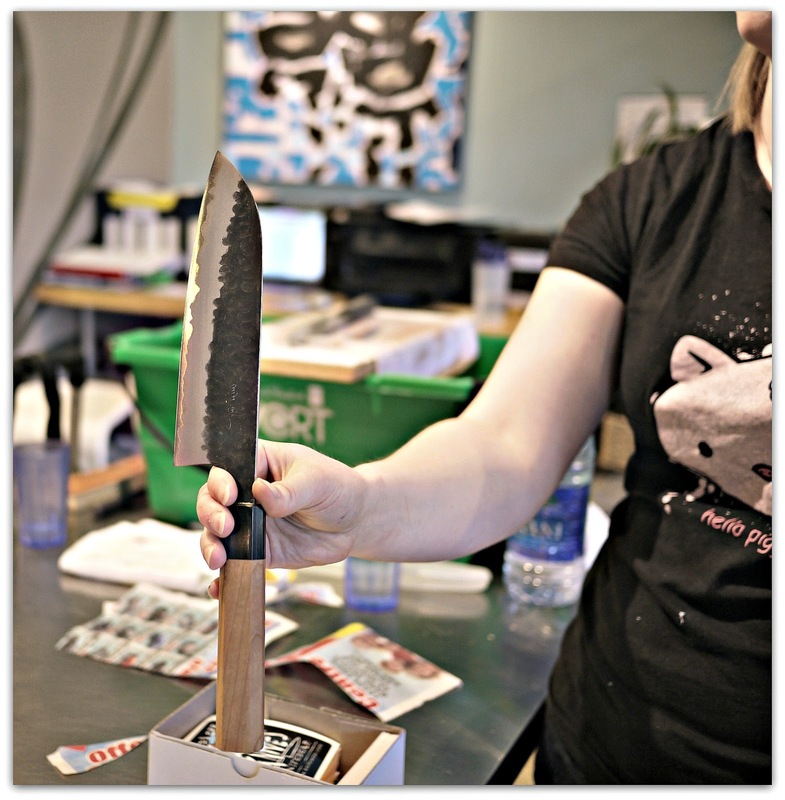 Heather of Knifewear brought a covetous selection of Japanese knives with her. Each of them was created by a different process and after a brief explanation of how the different knives were made, their composition, virtues and disadvantages, we got down to it. Out came her portable knife sharpening kit that consisted of a towel-covered board suspended over a plastic box filled with water. Submerged in the water were her whetstones, from fine to ultra-fine. On dry land she had a ceramic steel, a strop, and a water bottle from which she periodically squirted water over the whetstones. 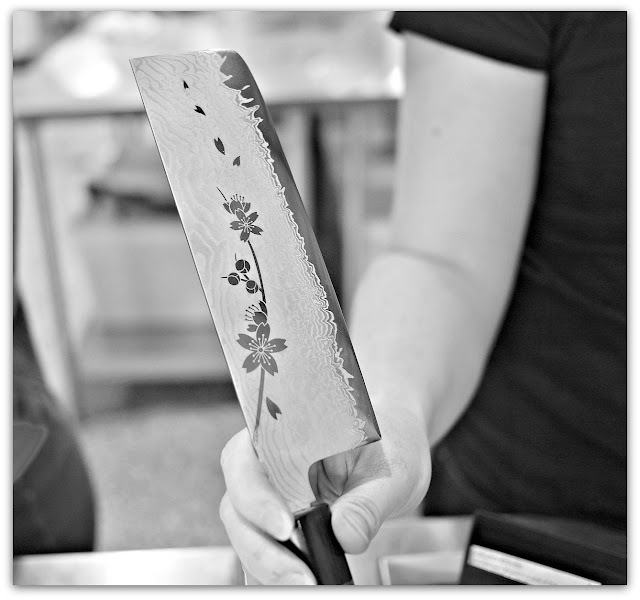 While we watched and listened, Heather explained the sharpening process and the rigorous training she and her colleagues underwent in the hands of a demanding Japanese master. To begin the sharpening process, she covered her thumbs with rubber finger pads and placed two pennies and a nickel in the middle of the first of two whetstones. She positioned the knife over the coins which served as a guide to calibrate the correct angle for sharpening. Then she rested the back of the knife blade between two rows of the raised dots on her thumb pad as a guide to keep her fingers and the knife at the correct angle for the duration of the sharpening process. Then she removed the coins. How clever was that? Over and over again, she gently and skilfully slid the knife, back and forth from tip to heel on the first whetstone and then the other. 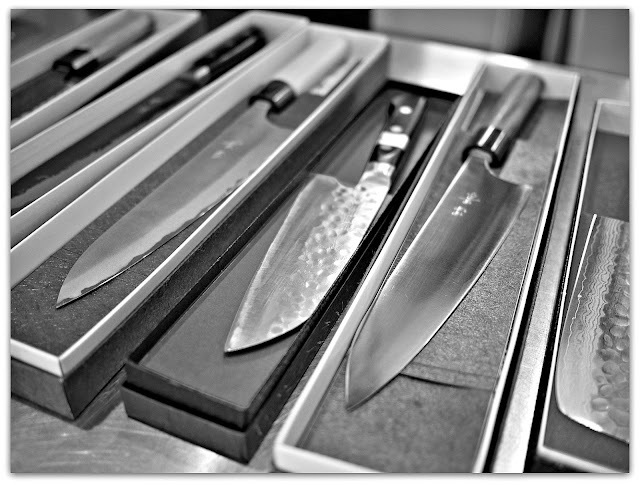 The first whetstone had a grit number of 4,000 (naka-to or very fine) and the second, 8,000 (shiage-to or ultra-fine). She finished the process by running the knife over a strop. With the sharpening and stropping done, she lifted a piece of newspaper and while she sliced soundlessly through it, I imagined what a pleasure that knife would be to use. As luck would have it, were about to find out. Heather invited us to try the knives she brought and Jennifer put out a box of sacrificial fruits and vegetables. We all chose a knife and set to slicing, dicing, and chopping. After watching Heather's demonstration I'm not sure if I'd ever attempt to sharpen my Japanese knives on my own. What I learned is that knife sharpening may look easy when done by a skilled professional but I think I'll chicken out and leave it to them. And seeing as their new shop will be opening in early July just down the street, why not? They also offer a knife repair service. I wonder if they can fix my Wusthof knife? Knifewear will be opening in mid-July on Bank Street between Third and Fourth Avenue in the Glebe.